Some would argue that the game of football is won and lost in the trenches. This season for the Washington Redskins the head coach and starting quarterback positions hang in the balance of the offensive line’s production. To be specific: pass protection. Since taking his first snap during the middle of the 2006 season Campbell has improved in every major statistical category (attempts, completions, completion percentage, yards, and touchdowns) for a quarterback. Head coach Jim Zorn was brought into Washington as a quarterback guru but the poor performance in the passing game down the stretch of his first season as coach had some fans calling for J.Z.’s job. Not so fast, comrades! Coach Zorn wasn’t the man out there missing blocks or giving up sacks. No, no, no. The fault lies with coverage sacks, collapsed pockets, and a front line all above 31 years of age just as much as it does with the head coach and/or QB. 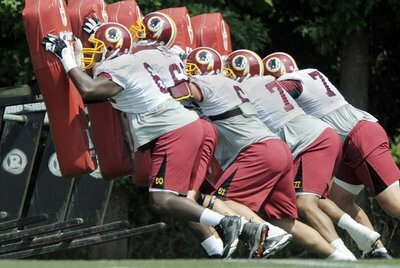 The free agency acquirement of former Redskin and Bill, Derrick Dockery, adds size and youth to the offensive line. Along with those qualities, Dockery is a player that is familiar with O-Line coach Joe Bugel’s blocking schemes. Mix that with the maturity of second year man Chad Rinehart, emergence of a healthy Stephon Heyer, and leadership of six-time pro bowler Chris Samuels and the Redskins just might be turning into a team with a potent air attack.